The Cure Breast Cancer Foundation is gearing up for another event filled October as it prepares to celebrate Breast Cancer Awareness Month and continue important fundraising efforts to support breast cancer research and the work of Dr. Larry Norton and colleagues at Memorial Sloan-Kettering Cancer Center and other national and international research facilities. CBCF will also welcome a new partner the October. The Colts Neck PBA will host the annual Race For CBCF on Sunday, October 5th at 105 Bucks Mill Road in Colts Neck, N.J. The 5K race/two-mile walk will being at 8 AM and include food drinks, give-a-ways and music. Registration is $25 and racers will receive a T-shirt. Participants can register at http://www.curebreastcancerfoundation.org/events/upcoming-events/colts-neck-pba-annual-5k-race-for-cbcf.html. On October 9th CBCF will once again join with Theory, the popular men’s and women’s contemporary clothing retailer, for an exclusive night of private shopping, cocktails and hors d’oeuvres at its location at 40 Gansevoort Street in New York City from 6:30-9 PM. The event – where shoppers received 25% off purchases – is traditionally one of the most successful shopping events held by CBCF. 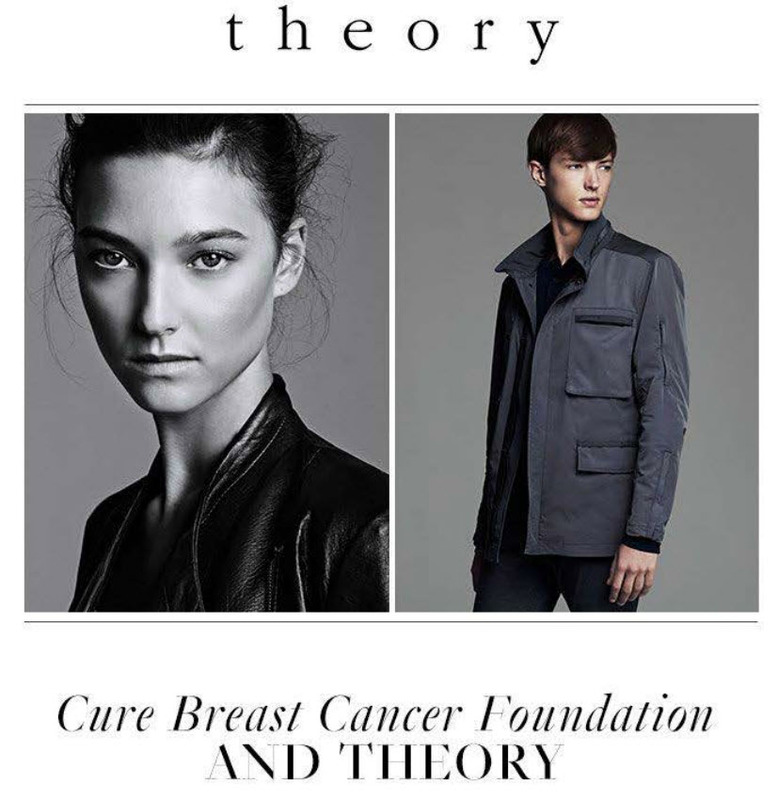 Theory will donate 15% of sales to the Clifton, N.J.-based organization. In addition, Pure City Cycles has teamed with CBCF to introduce a special new month-long partnership. The fast growing urban bicycle company will introduce a new bike featuring the CBCF logo to be sold exclusively in October on http://www.purecitycycles.com. CBCF will receive $100 per bike sold from October 1st to October 31st. For additional information or to participate in any of these events, please visit http://curebreastcancerfoundation.org. The Clifton, N.J.-based CBCF is a non-profit 501 (c) 3 organization which raises important funds to support breast cancer research efforts under the direction of Dr. Larry Norton, the Deputy Physician-in-Chief for Breast Cancer Programs and the Medical Director of the Evelyn H. Lauder Breast Center at Memorial Sloan-Kettering Cancer Center. Since its inception in December 2007, CBCF has raised in excess of $5 million through events such as its annual Golf Classic, walk-a-thons, fashion shows and other fundraising activities. Fully 100% of its net fundraising proceeds received by the foundation are donated to the Memorial Sloan-Kettering Cancer Center in Manhattan and other national and international cancer research facilities to support the research being conducted under the direction of Dr. Norton and his colleagues. This method of growth is indeed true in certain experimental models and research is ongoing to prove that it happens in people as well. It explains many aspects of cancer: rapid growth, disorganization, formation of new blood vessels, need to irradiate a breast after lumpectomy for cancer and the association of all of the above with distant metastases. If correct, it will provide new targets for the development of drugs to treat and prevent cancer. Since “seeding” is an abnormal process—as opposed to the normal process of mitosis—such drugs may not only be more effective, but less toxic as well. Hence, the concept of self-seeding is not only interesting from the point of view of biology, but possibly very important in the design of better approaches to cancer management and prevention, as well as in finding a cure. The Cure Breast Cancer Foundation (CBCF) is a Clifton, N.J. – based not-for-profit 501(c) 3 charity devoted to fund research on the growth and spreading of breast cancer cells, also known as the Self-Seeding Theory, at the Memorial Sloan-Kettering Cancer Center in Manhattan and other national and international cancer research facilities under the direction of Dr. Larry Norton, who serves as the Foundation’s Scientific Advisor. The founder and president is Carly Abramson. Her father, Andrew Abramson, is Treasurer. For more information, call (973) 471-CBCF (2223), e-mail mailto:info@curebreastcancerfoundation.org or visit http://www.curebreastcancerfoundation.org. Open House: Comeback for Harrison, N.J.